What Is Usher’s Syndrome? Usher’s syndrome is a disorder affecting both the ears and eyes. Over time visual function deteriorates along with a distinct reduction in hearing ability. To suffer from both hearing loss and sight problems from an early age are quite rare so the first diagnosis of Usher’s syndrome is usually correct. There are three types of this syndrome, named types 1, 2 and 3, each having it’s own characteristics. Type 1 is indicated by having severe hearing loss present from birth along with a delay in walking and ambulatory function due to interferences with balance. Sight often begins to deteriorate shortly before the teenage years, usually developing into total blindness. These children are often taught to sign at the earliest age possible as their method of communication. 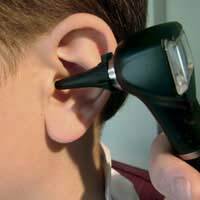 Those diagnosed with type 2 Usher’s syndrome will have been born with some degree of hearing function and when old enough, may benefit from the use of hearing devices. Sight normally begins to deteriorate after puberty and can progress to total blindness over time. Type 3 of this syndrome is displayed in those who have normal hearing and sight abilities until the teenage years when both begin to worsen as time progresses. The later part of life is often spent with both blindness and deafness. Usher’s syndrome is a genetic condition that is passed down from parents to the child. In order for the child to present with Usher’s syndrome, each parent needs to contribute a carrying gene. Many parents are unaware that they are carriers of this gene until they are combined with that of another person and an offspring is diagnosed with the syndrome.The person affected by this syndrome may go on to have their own children who will probably be unaffected by the condition unless the other parent is a carrier also. At the current time, there is no cure for this syndrome and the best treatment options lay with early and accurate diagnosis allowing the person, family and specialists to plan care.Sufficient explanations must be given to the child so they can be included into the planning procedures. Regular hearing and sight tests will be necessary to monitor the condition and make changes to hearing aids and eye wear as necessary. Most specialists agree that the child should be fully informed of their condition at as early an age as possible so they can plan for the future and know what to expect. This way there are no nasty shocks in store as sight and hearing worsen and if they are told when they are young, they seem to take it all in their stride and manage their condition quite well. Usher’s syndrome is an inherited condition that affects the offspring of parents who are both carriers of the gene. It affects both sight and hearing ability, and can present in three different types.Normally the overall outcome for each type will be severe hearing loss and blindness, but the development of the syndrome varies with each type.At the present time there is no cure and treatment lies with accurate diagnosis, regular check-ups and the use of hearing aids and visual devices when possible.